The evidence has provided many theories regarding how the ankle foot complex are functioning in weight bearing and non weight bearing tasks. Some of these theories are outdated and others are in need for further investigations. This proposes challenges on the clinical practice and complicates the assessment and management process. It is important not just to understand the models of foot function but also to be critical and develop questions in regards with their applicability and functionality. 4 Models will be discussed: Root theory, Sagittal Plane Facilitation Theory, Subtalar Joint Axis Location and Rotational Equilibrium Theory, and the Tissue Stress Model. The root theory was originally developed by Dr.Merton L. Root during the late 1950s through early 1960s. It is also known as “the foot morphology theory,” “the subtalar joint neutral theory,” or simply “Rootian theory”. Simply the root theory is based on a series of static measurements that is believed by the author to predict kinematic function. In order for the foot to be normal, the subtalar joint (STJ) should be in neutral position with the midtarsal joint fully locked, this occurs between mid-stance and heel-off during walking. Any deviations from the stated STJ alignment is considered to be abnormal and should, therefore, exhibit mechanical dysfunction. Despite receiving clinical popularity and being utilized in most podiatry and orthopedic literature, the root theory is questioned with regards to its reliability, validity and practicality. In the 1950s and 60s advanced measuring equipment wasn't available. In addition, most of the research done using this method has been conducted with techniques different from those proposed by Dr. Root. It is also worth to note that Dr. Root has prescribed orthotics in his practice, but the exact methods weren't published or documented, therefore, interpretations of such methods cannot be reliable. A 2017 study by Jarvis et al was conducted to investigate foot kinematics between normal and abnormal feet classified according to Root et al, determine if the degree of structural deformity is associated with the degree of compensations and finally to measure subtalar joint position during gait in pain free feet. The results of the kinematic analysis of this study reported no association between the deformities proposed by Root et al. and the differences in foot kinematics during gait. STJ inversion in neutral calcaneal standing position (NCSP ) has no relation to rearfoot kinematics, this means that the clinical use of “subtalar joint neutral” might not provide clinicians with realistic information. Jarvis et al also found the first MPJ dorsiflexion during gait propulsion much less than 65°as proposed by Root. It is evident that not all feet with structural deformities should exhibit symptoms and their function will be affected, therefore the root's classification seems to be invalid and believed to be no longer suitable for professional practice. A simple explanation of why static assessment doesn't necessary reflect kinematic characteristics is that it is taken in non-weight bearing position which may not mimic the applied external and muscular force in weight bearing. The center of the body mass translates anteroposteriorly during each step. For this to occur, approximately 75° of the step motion is required during the single limb support and about 15° of simultaneous internal and external rotation of the weight bearing side. Therefore, the amount of sagittal plane motion required with every step is 500% that of transverse or frontal plane motion. The rocker bottom side of the calcaneum, to allow motion from heel strike to forefoot contact. 10° dorsiflexion of tibia on talus prior to heel-off. Metatarsophalangeal joints rocker are the final pivotal site with heel-off, providing foot stability through the windlass mechanism. Ankle equinus, or limited weight bearing ankle dorsiflexion to 10° or less. Forefoot equinus, or a lower forefoot on the ground plane relative to the heel. Loss of metatarsophalangeal joints motion that could be structural or functional as in hallux limitus or hallux rigidus. In functional hallux limitus, there is a relationship between hallux dorsiflexion and first metatarsal plantarflexion. The dorsiflexion restriction is limited to weight bearing positions. Because other structures may get involved to compensate the insufficient movement, it makes it hard to be detected by clinical gait observation (occurs for a very short time 100 msec). The loss of MTP movement can possibly explain late-midstance excessive foot pronation, the timing and direction of knee and hip motion, and improper flexion motions of the torso. In order to understand compensations of the lower limb, Howard Dananberg explained the lower limb joints functioning as a scissor-jack. The hip, knee, ankle, and MTP joints all extend and flex in an opposite direction from their adjacent joints. Restriction in the movement specific to propulsion during gait at any level will consequently affect the other joints and compensations will be required to occur either proximally and/or distally. For example, limited hip extension was found to be associated with functional hallux limitus. Dysfunction of foot mechanisms can be compensated by: apropulsive gait with delayed heel lift-off after contralateral foot contact, vertical lift of the foot off the supporting surface, the avoidance of first ray loading by adopting inversion and loading of the lateral column of the foot, propulsion with foot adduction or abduction and flexed body posture. The sagittal plane facilitation theory role is highlighted in the conservative treatment of functional hallux limitus by facilitating plantarflexion and eversion movement at the first metarsal level with hallux dorsiflexion. The Dananberg theory was further confirmed by Nester et al. The study measured the 3D kinematics using a 6 segment model; leg, calcaneus, midfoot (navicular and cuboid), lateral forefoot (fourth and fifth metatarsals), medial forefoot (first metatarsal) and hallux (Salford foot model) in a population of 100 pain free aged 18-45. They reported high variations in kinematic data and multi articular mechanism that result from interaction of all three body planes, however, the greatest contribution was notes at the sagittal plane from the ankle and sub talar joints (calcaneus-tibia in our data) and the hallux-medial forefoot joint. Swing phase kinematics were also highlighted in this study. It comprised primarily of dorsiflexion (except for the hallux), eversion and abduction, especially at the lateral and medial forefoot-midfoot joints. These movements resulted from both active muscle forces (e.g. concentric action of anterior tibialis and long toe extensor muscles) and passive elastic forces, e.g. plantar flexion of the hallux after toe off due to elastic energy stored in the plantar facia and long toe flexor muscle/tendons during propulsion. Passive forces are necessary to control the active forces, prepare a safe next step and avoid injuries. The oblique triplanar orientation of the subtalar joint (STJ) allows pronation and supination of the foot. Pronation is important during weight bearing activities to allow foot adaptation to irregular surfaces, while supination increases stability in the sagittal plane in the propulsive phase of the gait. The STJ is a complex joint that is believed to have multiple axes of rotation that depends on the joint's rotational position. Determining the spatial location of the STJ axis was investigated by several authors, their work suggests that the anatomical structure of the articulating surfaces; talus and calcaneus, integrate with each other in a three-dimentional relationship within the STJ range of motion to determine the spatial location of the STJ. In a study by Manter, the average STJ axis was placed in a 16° angulation from the sagittal plane and 42° from the transverse plane. However, other researchers found great variations between individuals in the STJ axis angulation in the sagittal and in the medial and/or lateral position directions in relation to the plantar foot. The weight bearing structures of the foot are: the medial calcaneal tubercle, the first through the fifth metatarsals and the base of the fifth metatarsal. Ground reaction force (GRF) and muscles (the posterior tibial, gastrocnemius, soleus, anterior tibial, flexor hallucis longus, and flexor digitorum longus) acting on the medial tubercle causes supination of the STJ. The opposite is true for GRF and muscles (the peroneus brevis, peroneus tertius, and extensor digitorum longus) exerting forces over the second through fifth metatarsals and the fifth metatarsal base cause pronation of the subtalar joint. On the other hand, Intrinsic muscles cannot produce either pronation or supination moments directly, since none of them cross the STJ. Their effect becomes prominent in resisting deformities and stabilizing the subtalar joint. Regardless of the force location, rearfoot or forefoot, acting medial or lateral to the subtalar joint it produces supination or pronation. The palpation method is used to determine the axis of the STJ. A convex shaped midfoot at the transverse plan, seen from above. A more medially positioned and internally rotated soft-tissue contour of the talar head and neck in relation to the calcaneus, also seen from above. A concavity in the medial midfoot and anterior t the medial malleolus, viewd from behind. The peroneal muscle tension is neccessary to counteract the excessive STJ supination moment to prevent the invidual from walking on the lateral aspect of the feet and also to prevent inversion ankle sprains. Inversion ankle sprains and peroneal tendinopathy are both associated with laterally deviated STJ. This theory was considered by researchers and clinicians in the management of foot conditions as an alternative to the root theory. It could be explained using the load deformation curve. Consisting of two regions; an elastic region and a plastic region. 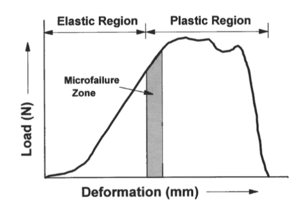 The area separating the elastic and plastic regions is considered the microfailure zone. the first region represent the area of normal tissue elasticity or the "give-and-take" of soft tissues, where regular loading and unloading occurs without inflammation or at tolerable level. Increasing levels of activity, deformation could occur beyond the zone of microfailure in the plastic region resulting in overuse injuries. Levels of tolerance are different among individuals according to their level of function and daily activities. Identify over stressed tissue through history, symptoms and subjective examination methods. Apply controlled stress to further test injured tissue by: weight bearing and non-weight bearing tests, as well as palpation, range of motion, and muscle function/strength assessment. Based on the evaluative findings, determine if the cause of the symptoms is secondary to excessive mechanical loading. Navicular drop test: a positive test along with tibial bending varus stress are associated with medial tibial stress syndrome, particularly in runners. Single leg squat test: is able to detect patellofemoral pain syndrome. Supination resistance test: used by orthotists and podiatrists for orthotics and foot cast modeling to determine the appropriate amount of force needed for correction. Jacks test: to measure hallux dorsiflexion. relevant to sagittal plane facilitation theory. A 29-year-old female college student presents with left heel pain for the past 2 months. Radiographic examination was negative. Her symptoms started one week after she began working as a waitress (standing 10-12 hours daily, 5 days a week). Before this job, the patient stated that she had a sedentary office job. Her current pain has become worse over the past 4 weeks particularly in the morning and resolves after 20-30 minutes of activity. It then starts again after 3-4 hours of constant walking and standing. the pain is relieved whenever she sat down for rest but revisits again as she stands up and resume working. The area of most pain was anterior and medial to the bottom of the heel. It is the first time for her to experience similar pain. her physician prescribed anti-inflammatory. When her footwear was examined, they were found to be extremely worn as well as poor fitting. The patient is also slightly overweight. From the history examination: it seems that this patient has over stressed her plantar fascia, resulting in tissue inflammation.The increased activity level (from sedentary job to a relatively demanding weight bearing job) appears to be related to the onset of symptoms. These clinical tests aims to stress the involved tissue in both weight-bearing and nonweight-bearing positions. Based on the evaluative findings, plantar fasciitis is caused by excessive mechanical loading resulting in over stressed tissue of the plantar aponeurosis. At this stage, the use of foot orthoses to reduce tissue stress might help with symptom-modulation. However, a more effective strategey should be integrated to correct pronation on the long term. The patient was asked to amend her working schedule to decrease the consecutive working hours. B- Symptomatic relief treatment is introduced once tissue stress is reduced. This include; modalities, soft tissue mobilization, and massage. C- Prevent recurrence of plantar fascia e.g; soft tissue mobility exercises to facilitate restricted the 1st MTPJ extension and strengthening exercises of the intrinsic and extrinsic muscles of the leg and foot to provide dynamic stabilization. The patient was also given recommendations to see a dietitian regarding a weight control program. The models of foot function face uncertainty and there is still a gap between research and practice that needs to be addressed. Although the root theory has been doubted and questioned, it is still hasn't faded in the clinical use and in the research. Can we assume that this theory has become an accepted 'clinical function'despite being considered as a clinical fiction? Until research comes with answers, it is important to keep an open mind and consider various philosophies in the realm of evidence. ↑ 1.0 1.1 1.2 1.3 Harradine P, Gates L, Bowen C. If it doesn't work, why do we still do it? The continuing use of subtalar joint neutral theory in the face of overpowering critical research. journal of orthopaedic & sports physical therapy. 2018 Mar;48(3):130-2. ↑ Root ML. Normal and abnormal function of the foot. Clinical biomechanics. 1977;2. ↑ 3.0 3.1 3.2 McPoil TG, Hunt GC. Evaluation and management of foot and ankle disorders: present problems and future directions. Journal of Orthopaedic & Sports Physical Therapy. 1995 Jun;21(6):381-8. ↑ Jarvis HL, Nester CJ, Bowden PD, Jones RK. Challenging the foundations of the clinical model of foot function: further evidence that the root model assessments fail to appropriately classify foot function. Journal of foot and ankle research. 2017 Dec;10(1):7. ↑ 6.0 6.1 6.2 Petcu D, Colda A. Foot Functioning Paradigms. Proceedings of the Romanian Academy. 2012 Jan 4:212-7. ↑ Dananberg HJ. Sagittal plane biomechanics. American Diabetes Association. Journal of the American Podiatric Medical Association. 2000 Jan;90(1):47-50. ↑ Dananberg HJ. Lower extremity mechanics and their effect on lumbosacral function. SPINE-PHILADELPHIA-HANLEY AND BELFUS-. 1995;9:389-. ↑ Nester CJ, Jarvis HL, Jones RK, Bowden PD, Liu A. Movement of the human foot in 100 pain free individuals aged 18–45: implications for understanding normal foot function. Journal of foot and ankle research. 2014 Dec;7(1):51. ↑ 10.0 10.1 Manter JT. Movements of the subtalar and transverse tarsal joints. The Anatomical Record. 1941 Aug;80(4):397-410. ↑ Root ML, Weed JH, Sgarlato TE, Bluth DR. Axis of motion of the subtalar joint. J Am Podiatry Assoc. 1966;56(4):149-55. ↑ van Langelaan EJ. A kinematical analysis of the tarsal joints. An X-ray photogrammetric study. Acta orthopaedica Scandinavica. Supplementum. 1983;204:1. ↑ Benink RJ. The constraint-mechanism of the human tarsus: a roentgenological experimental study. Acta Orthopaedica Scandinavica. 1985 Jan 1;56(sup215):1-35. ↑ 14.0 14.1 14.2 14.3 14.4 Kirby KA. Subtalar joint axis location and rotational equilibrium theory of foot function. Journal of the American Podiatric Medical Association. 2001 Oct;91(9):465-87. ↑ Noakes H, Payne C. The reliability of the manual supination resistance test. Journal of the American Podiatric Medical Association. 2003 May;93(3):185-9.